Shortly before midnight this date in 1979, Iranian royalist Generals Mehdi Rahimi, Reza Naji, Manuchehr Khosrodad, and Nematollah Nassiri were shot in a Tehran school courtyard after a snap trial by the newborn Iranian revolutionary regime. 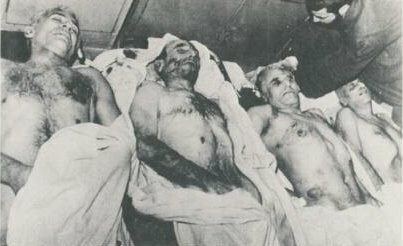 The Iranian Revolution had only just overthrown the remains of the absconded Shah’s regime; the country observes the “Decade of Fajr” over the first 11 days of February, commemorating the “Dawn” of the Islamic Republic from the return of Ayatollah Khomeini to the fall of the luckless loyalists installed by Pahlavi on his way out the door. In this uncertain situation, the new regime seized its newfound authority … violently. General Rahimi — probably the most voluptuously eulogized of the bunch — still pulls tribute for his loyalty to the collapsing monarchy, and his salute to the Shah even when in revolutionary custody. 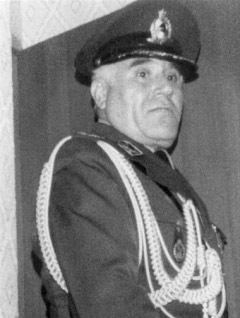 Lower-profile to posterity, Naji had once governed Isfahan under martial law; Khosrodad was a general of the air force; and Nassiri headed the hated secret police SAVAK. The first people I tried and punished for their deeds were Nematollah Nasiri, head of SAVAK, and Khosrodad, air force commander; Naji, martial law administrator of Esfahan, and Rahimi, martial law administrator of Tehran and head of police force. … All the people who were sentenced to death by the Revolutionary Tribunals were the best examples of ‘corruptor on earth’ and they were executed as such. A Corruptor on earth is a person who contributes to spreading and expanding corruption on earth. Corruption is what leads to the decline, destruction and the deviation of society from its nature. People who were executed had strived in spreading corruption and prostitution, circulating heroin, opium and licentious behavior, atheism, murder, betrayal, flattery, and, in sum, all these vile qualities. These people’s problems were aggravated by the fact that they did not repent once they saw the people’s revolution. I believed at the time, and I still believe, that all the parliamentarians and senators, all governors, heads of SAVAK and police, who held office after 1963 and the Imam’s boycott, should be sentenced to death. High-ranking ministry officials who were instrumental in the survival of the [Shah’s] apparatus and who, for getting close to the Shah and his family, would accept any humiliation are all convicted (condemned). To sum up, all the people that I condemned and who were executed in the early days of the establishment of the Revolutionary Tribunals and later in the Qasr prison were all corruptors on earth and, based on the Quran, their blood was a waste.